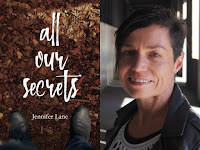 Jennifer Lane is a finalist for this year’s Ngaio Marsh Award for Best First Novel for her book ALL OUR SECRETS, which was also longlisted for the Ned Kelly Award for Best First Novel. 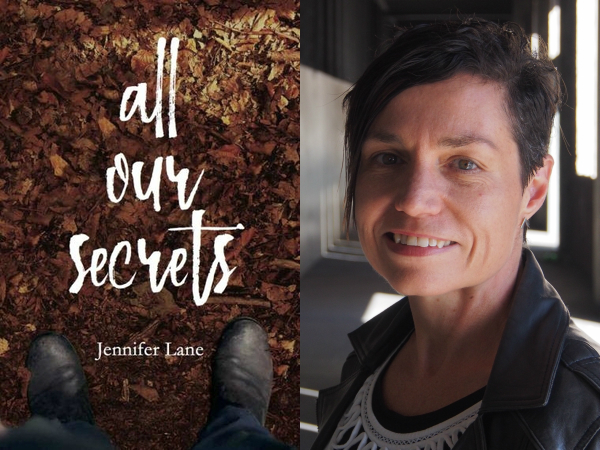 Jennifer is an award-winning short story writer, novelist, and copywriter in Wellington, the capital city of New Zealand. She was born in Australia, and her short stories have been published in journals and magazines in both countries. The Ngaio Marsh Awards are literary awards presented annually in New Zealand to recognize excellence in crime, mystery, thriller, and suspense writing (the Ned Kelly Awards are the Australian equivalents). Today’s post is part of the 2018 Ngaio Marsh Awards blog tour celebrating this year’s finalists. Thanks Jennifer for this post about the story behind your acclaimed debut! All Our Secrets was conceived when I was pregnant with my oldest daughter, Tess. She’s now almost the same height as me, has braces on her teeth, and has just chosen subjects for her first year at college, so to say it’s been a long journey is a major understatement. Fearing a fate similar to the one I’d inflicted on Gracie’s mum, I’d arranged to start my maternity leave four weeks before my due date. I’d imagined my waters breaking during a work meeting in a dramatic fiction-style fashion, and the baby introducing itself (Tess was still an ‘it’ back then, having stubbornly crossed her legs throughout the 20-week scan) to my workmates seconds before an ambulance came to my rescue. As it turned out, life didn’t imitate fiction; my baby wasn’t a drama queen. Nor was she in any kind of a hurry. Instead, I finished work with my dignity (and my waters) intact and devoted each morning to writing for three or four luxurious hours, my growing stomach pushing me further away from my desk each day. I wasn’t beautiful, far from it. I was so bony that my ribs poked out of my chest and, unlike some of the other girls in my class, I didn’t even have a hint of a chest. My blonde hair was frizzy and boring; Mum usually cut it level with the bottom of my neck, so it wasn’t long, but it wasn’t short either. Even worse, that summer it’d turned green from all the chlorine in the Coongahoola pool. My face was okay − if you squinted so you couldn’t see any freckles – but you’d have to be blind to call it beautiful. ‘Bloody hell!’ I said, catching my breath. There was a line, stretching as far as I could see, of cars, caravans and utes, all honking at the ancient ‘Welcome to Coongahoola’ sign as they crawled passed it. I pressed my hands to my ears as I watched, amazed. Inside the cars were people who might as well have come from another planet. I’m sure my mouth hung open; I’d never seen anything like it. All of the women wore what looked like tea towels on their heads. I soon realised they were veils just like the Virgin Mary’s. Even the kids wore them. A girl in the back of a Hillman like Grandma Bett’s stared at us as her car crept by. She could’ve been the same age as me, but it was hard to tell with a blue veil covering half of her spotty face. She seemed to find us as fascinating as we found her, but when Elijah and Michael waved, she quickly looked away. I’d only completed a few chapters, but I had the foundations of a novel. That was lucky because over the next few months, I considered something as simple as having a shower to be a significant achievement; writing didn’t even make it onto my daily try-to-do list. I was still working on All Our Secrets two years later when Tess’s sister Matilda was born – and when Matilda toddled off to crèche at 18 months old. Probably still when Tess started school at five. Those years are a blur of nappy-changing, crying, teething, napping/not-napping, crawling, falling, playdates, playdough, and lots and lots of glitter. I can’t say how long it took me to finish the first draft. I can say that the rest of the process – getting a mentor, finding an agent, looking for a publisher – took equally as long, if not longer. But that’s another story – one that I probably won’t get around to writing until my daughters leave home. The winners of this year’s Ngaio Marsh Awards will be announced on 1 September at the WORD Christchurch Festival. You can follow the awards on Facebook and Twitter for updates.